Former world rally champion Colin McRae has admitted he could struggle to get a drive next season after being dumped by Citroen. The Scotsman was the victim of a new rule from the FIA, motorsport's governing body, that each team can have only two cars next season. With Sebastien Loeb contracted to the team until 2005, Citroen were left with a choice between McRae and Spain's Carlos Sainz, who is also a former world champion. And McRae concedes that his best hope of a drive next season could be to drum up private funding in order to run his own car with one of the top four teams. 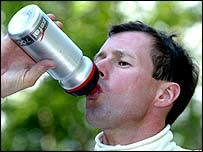 "I'm working on it at the moment," McRae told BBC Sport. "The ruling's still a bit unstable - the FIA are still playing around with it a bit so it makes it very difficult to know where to start. "Hopefully by the end of next week we will have a clearer picture of what it's going to be like next year and then we can start working on it. "It's probably going to mean finding some additional funding to run another car, a car with one of the main teams. "It's difficult enough to find an additional sponsor, but to find sponsors that are willing to pay for the whole program and obviously a fee as well is going to be very difficult - especially at this late point in the season. "I'm going to explore every avenue possible before the start of next season but my back could be against the wall a bit." McRae, 35, won the world championship in 1995 and joined Citroen last year. He is currently back in seventh position in the drivers' standings on 33 points. Sainz is second with 48 points, seven behind leader Richard Burns, with Loeb fourth on 45. "I don't think the world championship is going to be quite right if Colin is not around next season," said Burns, who is moving from Peugeot to Subaru for 2004. "He's a good name and a superb pull for the championship." Citroen sporting director Guy Frequelin said: "This has been one of the most difficult decisions I have ever had to make in my career. "I will try and find a sponsor but it will be difficult"